This Enfilading Lines Civil War blog has suffered a good bit of neglect over the past weeks. Along with my busyness and the editorship of a new sports blog (www.TheBaltimoreWire.com), there is also not much of grand significance to write about from 150 years ago in January of 1864. There has been no major fighting or actions since November of 1863, although almost daily there is news of skirmishing and varied guerrilla attacks on all front lines, in Charleston Harbor, along the Mississippi, etc. The situation looks quite bleak for the South. There are numerous command problems, particularly in the west. The populace is demoralized and discontented with the Davis Administration, conscription, and the deprivations of war. Lincoln has hopes of the War’s end in sight, and he is thinking through the issues of reconstruction and reunification. On the 23rd, Lincoln gives approval to a policy wherein plantation owners could hire back former slaves with fair-wage contracts. It has been a cold month, just as it was 150 years ago when New Year’s Day saw sub-zero temperatures as far south as Memphis. Even so, people do come to Antietam. As I tell people who tour the field on months without the foliage, there is a great deal more that can be seen as compared to the summer. For example, the entire terrain opposite the Georgian’s west back position overlooking the Burnside Bridge can be seen. There is no corn in the cornfield to obstruct view of the East Woods from the Hagerstown Pike. The Cost home and the Pry Mill can be seen from the high ground opposite on the west bank of the Antietam near the upper bridge. Nicodemus Heights stands out clearly, etc., etc. My first tour of the season was this past Monday, MLK Day. It was a good time with folks from Wisconsin in a family of three generations – grandparents, parents, and two children … a boy about age12 and a girl approximately seven-years-old. They had been to Gettysburg on Sunday and taken a tour with a guide from our counterpart organization there. At the end, as I was bidding them farewell, the little girl spontaneously rushed up and gave me a hug! And the mother said, “Well, wow … she didn’t do that with the Gettysburg guide yesterday!” Gotta say, I was flattered! A section on the side of the Burnside Bridge (on the north face near the west bank) came loose and fell into the creek last week. It can certainly be repaired, though the bridge is closed off for any type of access to place weight upon it. HERE is an article from the local Hagerstown newspaper. 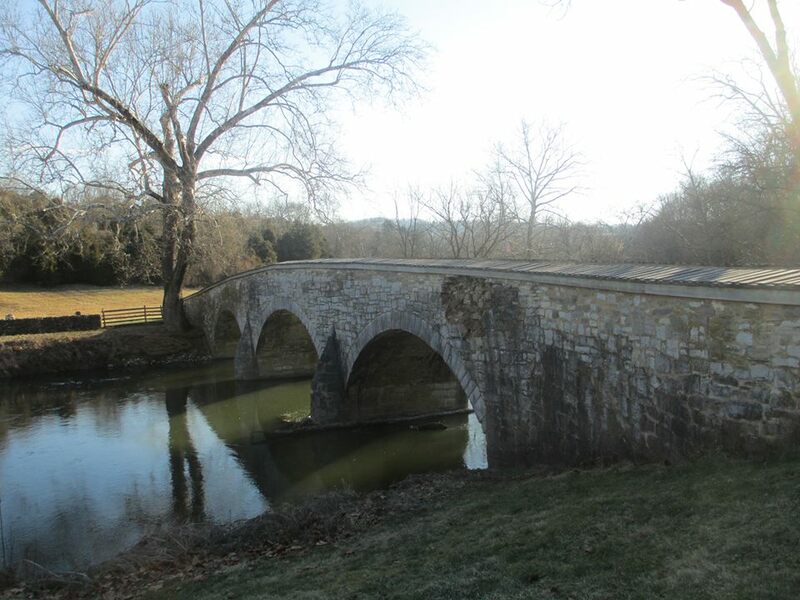 Posted by Randy Buchman on January 23, 2014 in Antietam / Battlefield Guides, General Civil War Themes, Sesquicentennial Series and tagged Antietam, Burnside Bridge.